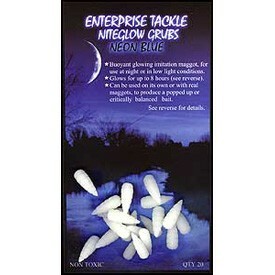 Enterprise Niteglow Grubs Neon Green Tests have proven that blue/green light is most visible to fish in low light conditions. Our Niteglow grubs contains high grade luminous additive giving a glow time of up to 8 hours when fully charged. Charge the grub for approximately 1-2 minutes, slowly rotating it in the beam to ensure all areas are fully charged. Charge times will vary depending on the type of torch being used. We recommend that you use our U. V. torch sold separately, for charging within 15 seconds. After the initial very bright glow, the grubs will continue to glow for several hours at a reduced level. We recommend recharging after 3-4 hours to maintain a good glow. QTY 20 Grubs can be used in conjunction with real maggots or fished on their own as a buoyant bait, when matched with an appropriate hook size. They are also useful when small fish arc a nuisance, and are constantly tearing real maggots. FREE Delivery on all Swift Artificial Baits over £100!! !